My experience in a village house! The title should actually be, ‘My bathing experience in a village house’! Recently, I went to a village-would-be-town-soon kinda place, to attend a marriage. It’s quite near a major town in TN. I had to stay in one of our relatives house, which had a longish construction design (as shown in the above diagram). The 1,2,3,4 are doors, actually. I went in the night, slept well and woke up on the next day morning. They asked me to take bath and get ready. I asked them to show me the bathroom and they showed me the place between door no. 2 and 3! I was taken aback for a second. It was not only open on the top, but people kept passing through from the entrance to the living room frequently through it! Remember, there was a marriage and hence there were quite a number of guests around. I waited for sometime, to see how others take bath over there. One person wrapped himself with a small towel, went to that place, started fetching cold water from the cement water tank (shown above) and started taking bath! He had another towel to wipe his body after he finished. Next it was my turn and I had only one towel! I told them about this in the hope of getting a spare towel, but perhaps because they were running out of towels, they asked me to take bath with my underwear. Imagine taking bath in a public place where people are moving around with just your underwear on!!!! For a person born and brought up in a city, the very thought was shocking! I thought, ‘Ok, lets finish this real quickly’ and got into the act. Now what happens, since people were freely moving between the door no. 2 and 3, one of my distant relative happened to recognize me. While I was taking bath, he decides to stop there and start an intrusive discussion. Oh god! I’ve seen houses like this a lot of times during my travel to distinct village/towns. Some people use this open roof top as a place to sit and read newspaper. In one similar such house, we stayed since it was near to a famous temple and we went for a thiruvizha kind of thing. The house had a bathroom with open roof and a window with no door to close it! I was so paranoid to even take bath and there were too many people roaming around there. I took bath with my clothes on and struggled so much to change over to a dry clothes. Big aunties used their underskirt, tied it till all the modest areas are covered, and happily took bath together! So, I am not alone with such experiences. I have seen such things in some village themed movies but this is the first time I was experiencing reality. Hey how you doing? long long time.. just came here to say “Hi!” 🙂 will be back to catch up on all the posts..
lol @ at the person conversing with you when you are bathing 😀 but have you never been to any village home before like for example your grandparents place? never bathed at a pond? Both sets of my grandparents have been living in Chennai. Their ancestral homes in villages are not there anymore. 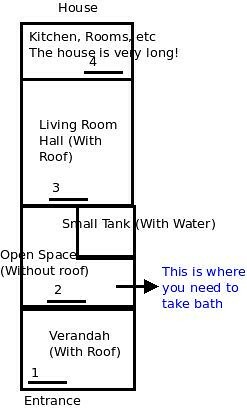 This is new to me because in our village house, our bathroom was a pit in a corner in the cow shed. The cows used to watch while we were taking bath. My sons were scared of them and were howling to enter the bathroom and the stench of the cow dung! ONE experience! I like the way you drew the picture of the house! He he he he 🙂 I enjoyed that article..
brought some memories of my village although our house was not exactly like that .. but I can understand .. some places had it that way ..
Next time I come to india and go to punjab You should come with me to our village , you will enjoy a lot more I can promise you that ..
Maybe, but there should have been a reason why it was constructed like that. Perhaps, during the older days people were taking bath in lake/river, etc and hence this was fine with them. I would love to live in that house! i could not stop laughing reading this post!!! if i was in your place i always carry a deo with me to replace bathing with deo shower when such conditions occur..